A magnifying glass that monitors the evolution of the mopes, a gadget that creates the active formulas depending on the skin’s needs or a cip that offers real-time notification regarding the skin’s status for the consumers interested in a healthy lifestyle. L’Oréal Romania launched the challenge during the six local edition of Brandstorm, one of the biggest competitions in the world for students and an accelerator for innovating ideas. Among the 90 projects and more than 450 entered participants, the Skintuition team- formed of Szabó Gellért, Klarisz Ilyés and Noémi Nagy, students at the Economic Science and Business Handling Faculty, part of the Cluj-Napoca Babes-Bolyai University -, attracted more the attention of the jury formed of L’Oréal Romania experts. the innovation brought by them implies the use of a 3D printer for the generating of facial masks with ingredients adapted to the consumer’s individual needs. The tool was thought in order to be used by the dermatologists and is connected to an app that allows the monitoring of the mask’s effects in real time. The facial masks are created from rice paper, being therefore extremely friendly with the environment. The winners will represent Romania in the international finale of the competition in Paris where it will compete for the big prize – an internship where they can develop their idea. For the first time, the winners of the international competition will have the opportunity of implementing the innovative ideas at Station F, the biggest space dedicated to the worldwide start-ups, in which more than 1000 companies found at the beginning of the road, but with a big potential of economic growth, put their ideas in work. For three months, L’Oréal will offer the winners a modern space for study and practice, in which they will be able to implement the innovations, from idea to the finish product, supported by the company’s experts. Through Brandstorm, we are encouraging the development of abilities such as the entrepreneurship, the creativity or the tenacity and we are challenging the students to become tomorrow’s innovators. Through the real business situations in which we are transposing them, challenging them to be creative and in the same time to experiment the life of a L’Oréal employer, having in the back our support in order to develop the ideas,” said Andreea Pavel, the coordinator of the Brandstorm competition at L’Oréal România. Brandstorm represents for us a first entrepreneurial experience that helped us find out-of-the-box ideas. We are looking forward to present our idea at the International Finale and to hope to come back with the Big Prize. We are recommending the future participants to give free space to their imagination and to accept challenges because they are taking us even farther. For us it worked,” said the winners. 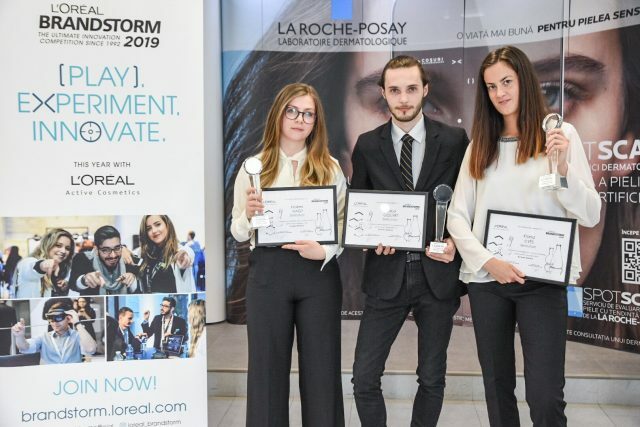 This year, the Brandstorm competition rolled together with L’Oréal’s Active Cosmetics Division, the world leader in the category of the dermatocosmetics products. Run by the vision – “Health is the future in beauty” – the division holds locally a portfolio of three complementary brands and a close relationship with the medical staff – dermatologists, paediatrists, pharmacists and doctors in the sphere of medical cosmetics. The students were therefore challenged to fully take advantage of the digital technology in order to create the future of the taking care of the consumers experience. Launched 27 years ago, L’Oréal Brandstorm became the biggest competition for students dedicated to the innovation in the world, bringing participants from 65 countries.